on reverse (no longer visible, photo in object file [1971.83.3] in NGA curatorial records): Biel Le Doyt. / Aged 24 years / Painted by / Erastus S. Field / Worcester, Mass. / 1827. Recorded as from Massachusetts. (Victor Spark, New York), by whom sold in 1948 to Edgar William and Bernice Chrysler Garbisch; gift to NGA, 1971. 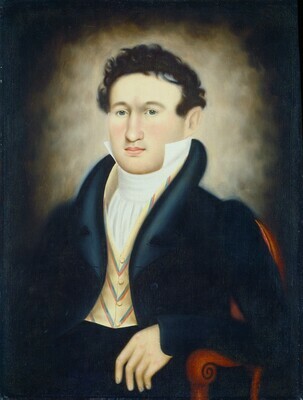 Erastus Salisbury Field, 1805-1900, Connecticut Historical Society, Hartford, 1963-1964, (cat. by Reginald French) in Connecticut Historical Society Bulletin 28 (October 1963): no. 131. Erastus Salisbury Field, 1805-1900, traveling exhibition, 1984-1985, 12, 94, no. 2, fig. 1 (cat. by Mary C. Black). First venue: Museum of Fine Arts, Springfield. French, Reginald F., and Agnes M. Dods. "Erastus Salisbury Field, 1805-1900." Connecticut Historical Society Bulletin 28 (October 1963): 98, 117 (includes their "Checklist of Paintings attributed to E.S. Field"). American Paintings: An Illustrated Catalogue. National Gallery of Art, Washington, 1980: 158, repro. Black, Mary C. "Erastus Salisbury Field, 1805-1900." In Lipman, Jean, and Tom Armstrong, eds. American Folk Painters of Three Centuries. Exh. cat. Whitney Museum of American Art, New York, 1980: 74. American Paintings: An Illustrated Catalogue. National Gallery of Art, Washington, 1992: 178, repro. Chotner, Deborah, with contributions by Julie Aronson, Sarah D. Cash, and Laurie Weitzenkorn. American Naive Paintings. The Collections of the National Gallery of Art Systematic Catalogue. Washington, D.C., 1992: 113, color repro. 114.